Finally,the ?holy? month is over. We are all done with the most boring world cup ever. The industrialized football issue dominated the ?thing? through this period and caused the supporters to get over very annoying games consisting of the damned vuvuzela, defensive football in cheap quality (not like Mourinho style) and the referee mistakes. Spain becomes the first champion which has won the title after losing their opening game. They had lost against Switzerland but then they dominated all their games as they did in EURO 2008. The most interesting point was that they defeated The Netherlands whose most famous player of all times, Johann Cruyff has settled down the infrastructure of Spanish football. Though David Villa seems to be the shining star for the team by scoring 5 goals, I think it was Iker Casillas who has shown a marvellous performance in every game. In the final, he deflected two certain attempts of Arjen Robben which made them get closer to hold the cup. The Netherlands played in a harsh tackling strategy as they were expected but they could not arrange the balance while being aggressive. It was the tolerence of Howard Webb, the English referee, that saved them from having early red cards through the game. I still cannot believe that Mark Van Bommel ended the cup without having seen any red card. The current generation of Spain has become a legend and their average age is only 26 which means that they will continue to dominate the world football in the following years. Some players like Fabregas, Mata, Jesus Navas are under 25 so they will have lots of victories in the upcoming tournaments probably. Oslo, Saturday afternoon. 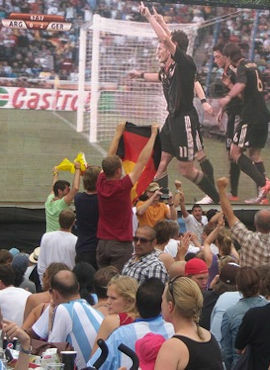 Several thousands people are watching Germany-Argentina on the big screen. The man opposite to me is wearing the German jersey. He is not German, but Norwegian. He is not the only one who identified with the”others? during the World Cup. Not only teams from the rich ?West? are popular. A few days ago, people from all nationalities cheered on Ghana. Norwegian TV2 interviewed fans of the Ivory Coast team in South Africa. Ivory Coast fans came from all over the world, and many of them were neither black nor from the Ivory Coast. Who Will Take Home The World Cup? Last month, just before the start of the Fifa World Cup, we looked at who would win based on online chatter. From our results we made the prediction that England would come out on top. Playing by the rules: as in football, so in life? Nigeria: Who changed the President’s mind? Facebook or FIFA? Nigeria is not a country known for its responsive leaders. High-level politicians rarely engage with the electorate, and it’s commonly complained that the voice of the people goes unheard. But newly-confirmed President Goodluck Jonathan may be changing that: a few weeks ago he opened a Facebook account, and two days later reversed a controversial decision after hundreds of fans posted disappointed reactions on his wall. In the past two weeks of World Cup action, 16 teams have been narrowed down to just two?Spain and the Netherlands?who will face off in the World Cup final tomorrow. For both countries, there are high stakes: not only are the two sides contending for the title of best football team in the world, but this will be the first-ever Cup win for either team and Spain is in the finals for the first time. We took another look at the search data to see what people have been interested in during the round of 16, quarterfinals and semifinals. So, as you all know, Spain beat the Netherlands and won the World Football Cup in Johannesburg on July 11, 2010. As most of you may also know, this victory was predicted by a German octopus named Paul. Paul was presented before the match with two transparent boxes each baited with mussel flesh and decorated one with the Spanish flag, the other with the Dutch flag, and, yes, Paul the octopus correctly chose the Spanish flag box. Who Won the World Cup Sponsors Title? With the 2010 World Cup now complete after three weeks of excitement, Spain now rules the soccer (football?) world. But what about the other action involving global superstars? The controversial decisions of several referees participating in the World Cup and their methods have been brought into question by fans, bloggers [ENG], journalists [ENG] and national football associations worldwide during this, the world?s largest international sporting event. Although FIFA President Blatter has made public apologies to Mexico and France for poor and arbitrary decisions, which does not lessen the irreversible damage done to these teams, FIFA obviously supports the referees’ decisions, and the organization’s Disciplinary Committee’s recent decisions, which are widely considered to be unfair and harsh, only make matters worse. Psychic octopus Paul was right and Spain clinched the World Cup in the football finals, which ended in South Africa a few minutes ago. In the Arab World, Twitter users shared a few thoughts on the finale and the tournament overall. Spain has defeated the Netherlands to win the FIFA World Cup for the first time. The press urges politicians to learn from the harmonious play of the Spanish team, praises the unaccustomed unity of the Netherlands during the World Cup and takes heart that at least in football, Europe is right at the top. While the International Monetary Fund has predicted a 0.4% decrease in the Spanish economy this year, economists note that the euphoria generated by Spain winning the FIFA World Cup for the first time ever yesterday (11 July) may boost growth by up to 0.7%. Will Soccer Bring an End to American Exceptionalism? We discussed American exceptionalism during the 2006 world cup: Soccer in German-American Relations and Soccer is for Losers? Soccer is getting increasingly popular in the US, which some conservative Americans don’t like. Is America becoming less exceptional now? Roy Greene, senior assistant metro editor at the Boston Globe, explained in an article on Poynter.org how the paper used crowdsourcing to complement its World Cup coverage. Who gained what in the World Cup? Last weekend, Spain won the 2010 World Cup. For the month leading up to the final, Googlers joined the world in cheering for their favorite teams. Around our campus, games were watched on computer screens and on cafe video screens. Code went unwritten. Emails went unanswered. Friendly and playful rivalry between competing nations during international sport events is common; but sometimes the competition goes too far, turning into personal and degrading attacks on a particular nation or culture. In Paraguay, the 2010 FIFA World Cup evidenced that Paraguayans had to look out for prejudice coming from the least expected source: international mainstream media from Brazil and Spain. After blowing the vuvuzela on its new-found sensitivity to the concerns of commercial rivals in the Strategy Review, just three months later the BBC?s online coverage of the world cup was characterised by excesses that would embarrass the revelers of Madrid the night after the final. The world cup is as hotly anticipated by advertising agencies and commercial media as by any football maniac. The event was predicted to rake in customers and would, for a short time at least, buck falling readership and advertising revenue. Previous Elif on TRT: Is something wrong with TRT?